This 26 July, 2016 hand out picture shows a clay pot with cheese at the Kalmar Museum, southern Sweden. Divers exploring the historic royal shipwreck "Kronan" off the south-east coast of Sweden have discovered 340-year-old cheese buried in the sea bed below the wreckage. HO / Kronanprojektet/Kalmar laens museum / AFP. STOCKHOLM (AFP).- Divers searching the wreck of an 17th-century Swedish warship on the bed of the Baltic say they have found de Brie. Sifting through the ancient timbers of the Kronan, a ship that sank in 1676 off the Swedish coast, they found not diamonds as they had hoped... but a cheese. 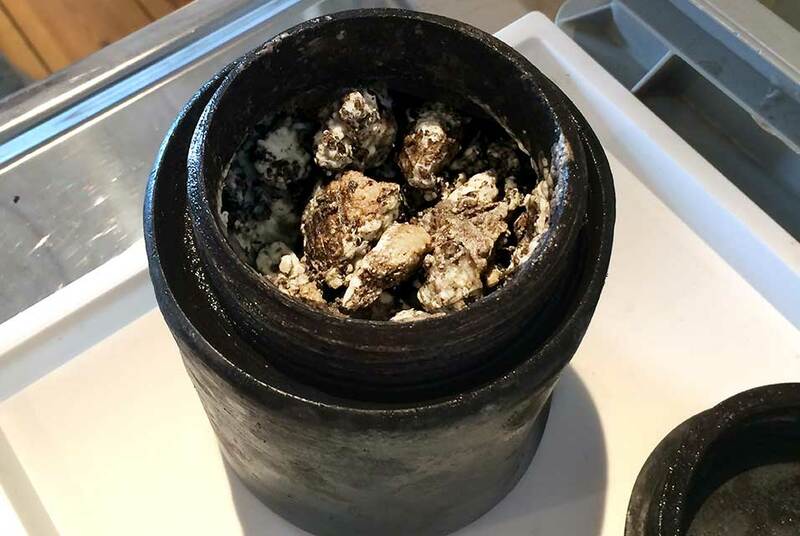 Inside a watertight pot was a semi-firm 340-year-old "dairy product" smelling of yeast and Roquefort cheese, expedition leader Lars Einarsson told AFP on Thursday. "Unlike the others, I find its smell is quite pleasant," he said. "It smells of life." The unusual find is being sent to the Swedish University of Agricultural Sciences for tests. The Kronan (Crown) sank off the island of Oeland, southeastern Sweden on June 1, 1676 in a battle with a Danish-Dutch fleet. Squabbling officers and too much sail caused the ship to capsize and then explode. Only about 40 of the 800 crew survived. The wreck was found in 1980 by Anders Franzen, an amateur naval archaeologist who 24 years earlier discovered the warship Vasa, which sank in 1628 in Stockholm port on its maiden voyage. The Vasa's timbers were brought to the surface -- the ship, housed in a maritime museum in Stockholm, is now one of Sweden's star attractions. But in the Kronan's case, the blast was so powerful that pieces of the ship were scattered over a wide area of seabed. Fishing nets, minesweeping and the forces of the sea have added to the dispersal. Around 80 percent of the estimated site has been explored, revealing a trove of treasure and historical artefacts. Around 30,000 items have been brought to the surface so far, including bronze cannon, chests, dishes, navigational instruments and a German-made trumpet, as well as diamonds and gold coins. Divers have also found flour, animal bones, liquor and wine -- items that are a potential bonanza for historians eager for insights into how food was made centuries ago. The cheese survived thanks to the chill and low salinity of the Baltic and the fact that it lay under a thick layer of sediment, which protected the pot from corrosion. In 2010, divers recovered 145 bottles of vintage Champagne from the wreck of a ship that sank off the Finnish archipelago of Aland between 1825 and 1830.